Ever since I fully grokked the ABC mode of the Materials Lab, I've been having loads of fun with making new textures. Polished marbled stone was what I was after, and this technique makes the mundane preset marbles much jazzier (and unfortunately, slower to render...). 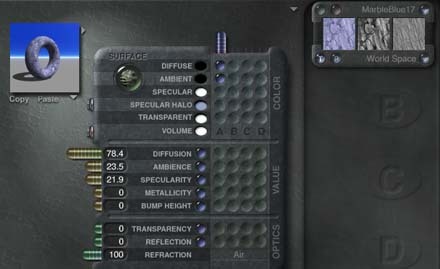 This is the preset material Marble, Blue-Purple found in the Rocks&Stones category. It looks pretty good, but it could be made better. Here's the tweaked version. It doesn't look all that different, but believe me, there are some powerful tools at work here which will open new pathways in your material tweakings. Only one change done at the Material Lab level was needed to change the second material into this one here. Once you've set up a material using the ABC mode, this type of tweak is quite simple. This one gets a little further off my track, but you'll be able to make materials like this based on the information in this tutorial without ever touching the deep texture editor! I like to start with a preset marble-like texture because that gives me some reasonable optical properties, and an interesting texture to work with. This is the Material Lab just after selecting that Marble, Blue-Purple out of the material preset Rocks&Stones category. The first thing we're going to do is add the preset texture in the material's A component to the Texture Library. The short story there is: Shift-click the button which brings up the menu shown in Figure 2. 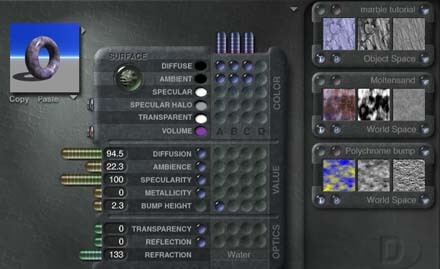 This brings up the Texture Library dialog, which is a graphical representation of your texture presets. It works the same way as any other presets dialog. I also have a somewhat longer, more confusing explanation of how to access the texture library. See my Secret Texture Library tutorial for more information. You'll also find there an explanation on the differences between a texture and a material. The next thing we're going to do is control-click in the C column for both diffuse color and ambient color. Page 224 in the Bryce3D manual has a brief explanation of ABC mode. Susan Kitchens covers ABC mode in Real World Bryce2 on pages 344-348. 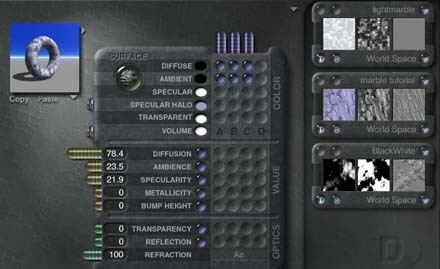 That'll give you random textures in the B and C slots, which could give you some interesting results or some ugly results... but don't worry, we're changing both. 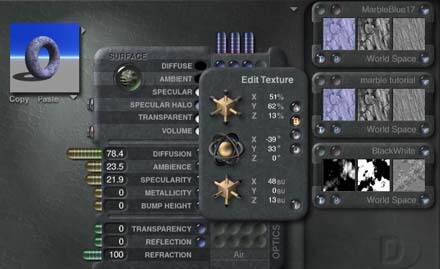 For the B slot, select the copy of texture A that you stashed in the texture library. This makes A and B exactly the same, but they won't be for long. 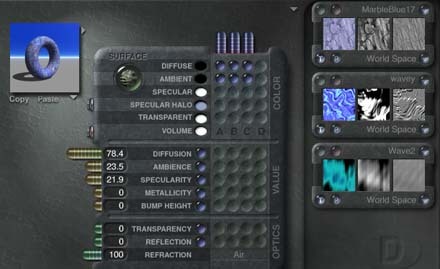 In either the A or B slot, bring up the 'shallow texture editor' (done with the blue button next to the pink one for the deep texture editor). In here, twist around a few angles, slide the texture along an axis or two and maybe stretch or compress it along a few different axes. The idea here is to make a texture that's the same coloring and same base texture, but just different enough to 'break up' the evenness of the preset. Wherever the value of C is black, texture A is applied. Wherever the value of C is white, texture B is applied. For breaking up the monotony of a preset marble, I like to use the BlackWhite texture preset in the Basic category. The Red Fractal preset also works quite well for this. Remember up a the top of this page when I mentioned only one change was needed to change the second material into the third material? Here's the Material Lab for that third material, and the only change was to make Texture A use my 'lightmarble' texture from my texture library. And that fourth material at the top of this page also uses this ABC technique, but the texture in the C slot, rather than having sharp delimitations between black and white areas instead smoothly transitions through shades of grey.